Suresh Ramalingam summarizes research he presented at the ASCO 2015 Annual Meeting about a new drug that could help delay or prevent resistance to lung cancer treatment. In his role as Winship's deputy director, Ramalingam will lead the integration of the research, clinical, and educational components within Winship. This position was previously held by Fadlo R. Khuri, MD who assumed the presidency of American University of Beirut in August 2015. "Dr. Ramalingam is an extraordinary leader and will advance Winship's efforts to lessen the burden of cancer through greater integration of research with the care of our patients," says Walter J. Curran, Jr., MD, executive director of Winship. "We are very fortunate to have Dr. Ramalingam serve in these pivotal leadership roles at Winship and the School of Medicine," says Christian P. Larsen, MD, DPhil, dean of the Emory University School of Medicine and CEO of The Emory Clinic. "His range of experiences and breadth of understanding of the cancer research landscape are exceptional- spanning target and drug discovery, exciting new developments in immunotherapy and value-oriented health services research. With his keen intellect, humble demeanor, collaborative nature, and a deep commitment to serve I have no doubt that he will have a powerful impact on the future of cancer research at Emory and beyond." 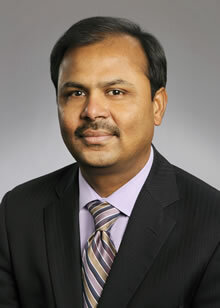 Ramalingam, a professor in Emory's Department of Hematology and Medical Oncology, now serves as Winship's director of medical oncology and its Lung Cancer Program. He currently co-leads Winship's Discovery and Developmental Therapeutics Program. Board certified in medical oncology and internal medicine, Ramalingam chairs the Thoracic Malignancies Committee and serves as deputy chair for the Therapeutics Program within ECOG ACRIN, a National Cancer Institute-supported national clinical trials group. His research focuses on agents that inhibit pathways for specific lung cancer mutations. He is also investigating ways to individualize therapies in patients with small cell and non-small cell lung cancer. Ramalingam has authored over 200 scientific publications and is the section editor for "Chest diseases" for the journal Cancer. He is on the editorial boards of the Journal of Clinical Oncology, Annals of Oncology, and Clinical Lung Cancer. He joined Winship and the faculty of Emory School of Medicine in 2007 and is the recipient of several awards including the James Eckman Award for Excellence in Teaching at Emory, ECOG-ACRIN Young Investigator Award, and the NCI Cancer Clinical Investigator Team Leadership Award. He was named a Georgia Cancer Coalition Distinguished Cancer Scholar in 2008.